Blender is a completely free, open-source 3D creation suite. The official website says Blender is perfect for individuals and small teams alike. Part of the reason is that Blender supports the 3D pipeline throughout the entire creation process. The fact that you can do all of this using Blender makes it a valuable creation software. And since it’s free and open-source… the pot really can’t get any sweeter. In case you’re unfamiliar with open-source, we’ll break it down for you. Open-source means you are completely free to change the code. When you download the Blender creation kit, you’ll get access to 100% of the code that is making Blender run. And Blender encourages you to manipulate it however you’d like! If you’re a beginner, open-source code manipulation might not be on your radar yet, and that’s OK. Hundreds of other people around the world are constantly tweaking and developing Blender. Since there’s such a large community involvement, the changes being made constantly lead to new features released to the masses. Not to mention bugs are fixed faster and the usability is always getting better. So even if you don’t have any interest in tweaking the source code, you benefit from others doing it. Blender is a cross-platform 3D development tool, so you’ll be good to go regardless of whether you use Linux, Windows, or Mac. If for some reason you have more specific computing concerns, check the supported platform database for a complete list of developer-tested computers. YouTube fans, unite! Here’s a tutorial series put together by YouTuber BornCg. It covers the basics for the Blender game engine. The series starts with the bare bone basics of using Blender, so you don’t need to have any experience with Blender prior to diving in. You also don’t need any programming experience, as BornCG doesn’t use Python programming to teach you in his tutorials. This series has 22 videos in it, some are short, like under 20 minutes, others break the 50 minute mark. IT bounces around depending on the complexity of the topic he’s covering. He also has a Blender 2.7 Tutorial playlist. This playlist contains 79 videos covering all kinds of Blender elements, not just game creation. So if you want to do more than just create a game, if you want to really learn the ins and outs of Blender and what the 3D creation engine can really do, give this tutorial playlist a watch. This YouTuber has spent the last eight years teaching all kinds of people how to use creative technology. Sometimes he talks really fast through a string of 2 to 5 words and it’s hard to catch what he said. But his video is very clear so your brain will retroactively fill in what he says based on what he’s gesturing to in his video. The majority of the time he speaks clearly, so don’t get turned off in the first episode. If you adapt your hearing for his speaking style and stick with the tutorials, you’ll be using Blender on your own in no time. What kind of free-to-use, open-source 3D creation engine wouldn’t offer a compilation of tutorials? Not the Blender kind! In the support section of the Blender website you can find an FAQ tab, a User Communities tab, and a Tutorials tab. These three resources alone will provide you ample guided material and assistance to get started using the creation software. The page has an Introduction for Beginners tutorial which links to a tutorial perfect for you if you want help even starting at the downloading stage. Then there’s the link to Beginner Tutorials which has a hearty amount of tutorial lessons to get you up to speed, and doesn’t coddle you quite as much as the “introduction for Beginners” tutorial. Also, all of the lessons from this tutorial are available for iPhone and iPad download. It’s provided via Tufts University in the iTunesU store. Could be helpful if you want to learn on the go, or for the dual-screen interface opportunities. 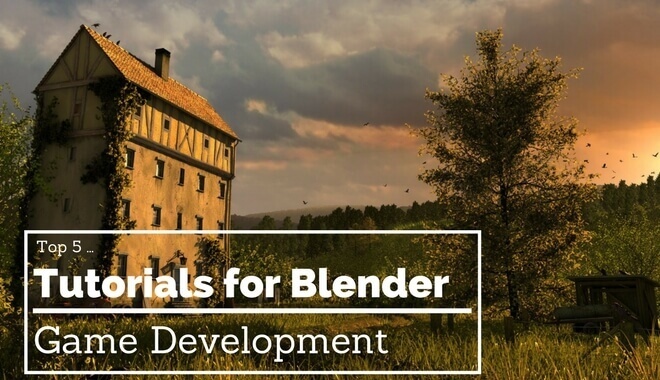 There are many, many more tutorials in the collection the Blender community put together, so if you’re struggling with something specific be sure to check here. Modeling, shading and textures, rigging, compositing, lighting and rendering, dynamics and simulation, and more — it’s all covered pretty extensively. Sometimes developers will use Blender to create a 2D or 3D asset for use in a separate game engine, like Unity. If you have no experience with Blender and want to build a “low polygon full textured game model” then this is the tutorial for you. If you just want to use Blender to make game art for right now, then you can start with this tutorial. The only knowledge it assumes you have is knowledge from the prior section of the tutorial. You can confidently start with zero knowledge on this game art tutorial. In addition to a fun name, KatsBits offers game design and content creation tutorials for Blender (and more!). There are tutorials that cover making a simple sword, creating double-sided meshes, simple map creation, and much, much more. These are largely text-based tutorials with a healthy amount of images logically placed to help you navigate the tutorial. In addition to helping you create content in Blender, these tutorials also teach the skills you need to create models and create levels in an optimized, efficient way. The explanations are in-depth, and cover unique, specific topics (Like “Make a Medieval Chair in 7 Steps). It’s worth checking out KatsBits as you gain more experience with Blender. This site is updated with fresh Blender news every day, and the site was founded over ten years ago. It’s no wonder, then, that the tutorials section has hundreds of pages worth of content for you to check out. New tutorials are added almost daily. It might seem like a lot to keep up with, but luckily for all of us, there’s a search function attached to the site. If you find a tutorial you like (there’s a cool speed-rendering of the WoW sword Frostmourne), you can search a keyword and have it pop up without navigating pages and pages to get there. Or, if you’re looking for help on a specific topic, plug it in and see if any results are returned for you. Based on the scope of this database, it’s pretty likely that you’ll have some results returned. The site is founded by the guy who ran the crowdfunding campaign to open source Blender, so you know he’s coming from a passionate, dedicated place.